This is the first game in the Star Wars: Knights of the Old Republic series. 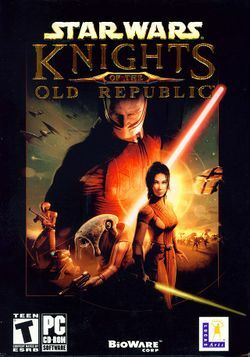 For other games in the series see the Star Wars: Knights of the Old Republic category. Star Wars: Knights of the Old Republic (KotOR) is a 2003 role-playing game developed by BioWare. Gain followers from the planets you visit, from a Twi'lek teenager to a trigger-happy droid to an elderly but irreverent Jedi. The choices you make influence the lives of those around you, and when faced with the ultimate decision, will you bring hope to the Jedi and the Republic or will you condemn the galaxy to centuries of rule under the Sith? Players take the role of a custom character whose choices not only affect their own destiny, but that of the galaxy as well. KotOR utilizes the d20 system like that used in Dungeons & Dragons tabletop role-playing games. Combat occurs in rounds, with the player using an attack or power, followed by enemy turns. Also, two NPC party members can join you in battle throughout the game, and their skills (or lack thereof) can greatly impact the way the game is played. This page has been accessed 310,257 times.